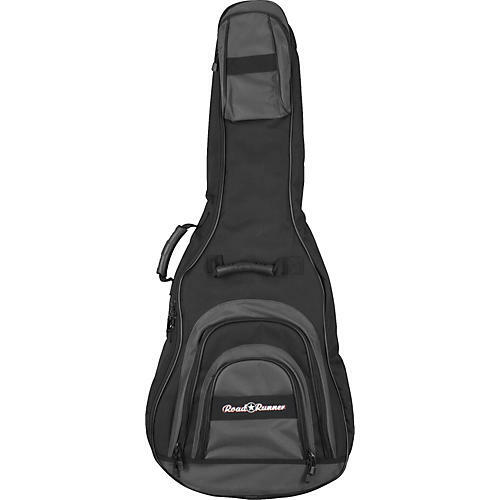 Thie Road Runner Roadster Classical Guitar Gig Bag is a trustworthy companion for your guitar. The bag boasts a hip grey-and-black, super-tough Cordura exterior and thick 1" foam padding. Road Runner provided lots of smart pockets and comfortable, convenient handles that make the classical guitar bag one with brains as well as brawn. Road Runner builds in a soft nonslip lining and backpack-style padded straps that zip in and out of their own pocket for storage. The Roadster gig bag's contoured rubber handles provide a comfortable grip that's tough enough to last. The gig bag's interior has reinforced headstock and bridge protection with padded, snag-resistant nylon. 3 separate outer pockets have zipper closures, and the largest has an interior pocket organizer for picks, pens, and other miscellaneous guitar accessories.